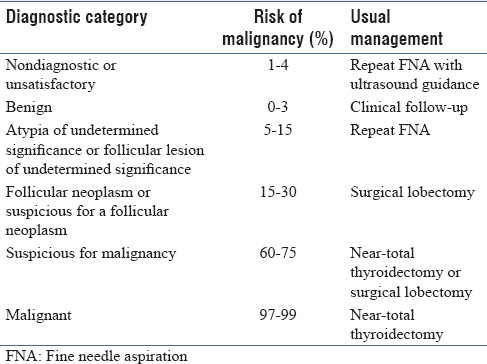 Fine needle aspiration (FNA) plays a crucial role in the evaluation of thyroid nodules. However, studies have shown that up to 30% of thyroid FNA were diagnosed previously as “atypical,” “indeterminate,” and “suspicious for malignancy.” Thus in October 2007, the Bethesda system for reporting thyroid cytopathology (TBSRTC) was designed to establish uniformity in diagnosing thyroid FNA cases and guiding the clinical management. In this study, a comparison was attempted between reports given 2.5 years before and after implementation of TBSRC in our institution. This study aims to identify pitfalls in the diagnosis of thyroid FNA cytology (FNAC) and identify the spectrum of thyroid lesions. This is a hospital-based cross-sectional study of 109 cases conducted in a tertiary care center from June 2009 to June 2014. Ethical clearance was obtained from Institutional Review Committee. (Code No. IRC/477/015). All thyroid FNACs performed during the study period were included in the study. Cases in which histopathology report was not available were excluded from the study. Of the total 109 cases studied, in 68 cases, FNAC reports had not been provided according to TBSRTC. The remaining of 41 cases had been reported using TBSRTC. All cases (68) were reviewed independently (by PU and SD) and reclassified according to TBSRTC. Cases with mismatch between histopathological and cytological correlation were also reviewed by two investigators (PU and SD) independently and were recategorized into TBSRTC. The common reasons for morphologic interpretative errors in cytology were sought and are presented in subsequent tables. Data were entered into Microsoft Excel 2007 and converted into SPSS ver. 11.5 for statistical analysis. The category names used in this study to categorize reports before TBSRTC were as follows: inadequate, descriptive reports, benign, suspicious for malignancy, and malignancy. 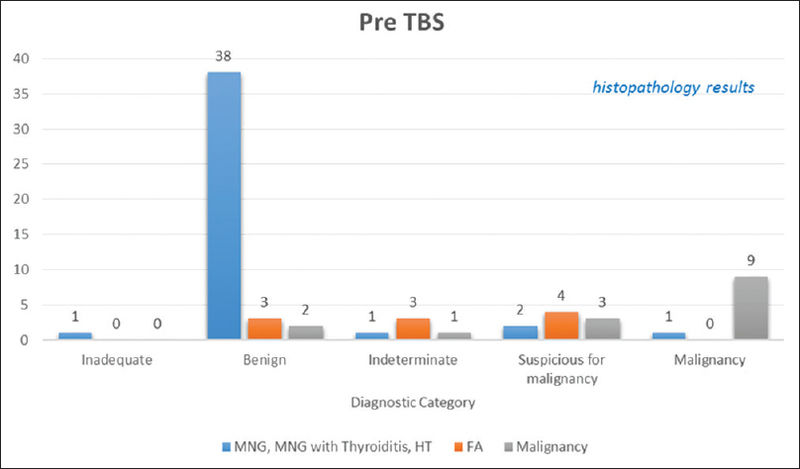 The spectrums of thyroid lesions categorized with and without using TBSRC are shown in [Figure 1] and [Figure 2], respectively. Comparison between the two eras revealed that there was a total absence of vague descriptive reports from 7.3% to 0% in the post-Bethesda era [Table 1]. We also observed that there was an ability to look out for follicular neoplasm from 0% to 11.9% once we confined ourselves to the diagnostic tier of TBSRTC. There was an improvement in making a definite diagnosis of malignancy from 14% to 19% and therefore a corresponding decrease on suspicious diagnoses from 13% to 4%. After having categorized the FNAC reports into two types, the next step was to compare these diagnostic categories with biopsy reports. In the pre-Bethesda era, 60% of the indeterminate cases turned out to be follicular neoplasm on histopathology. However, after the implementation of TBSRTC, 83.3% of these cases were suspected as follicular neoplasm on FNAC. The fraction of cases that actually turned out to be malignant out of the category labeled as “suspicious” increased in the post-Bethesda era to 80% from that of 33% of the pre-Bethesda era. Therefore, the category “suspicious for follicular neoplasm” acted as a safety zone or as an emergency collection basket which could save from misdiagnosis of thyroid neoplasm into other benign categories. And the exact diagnosis could be sorted out later during histopathology. The next step was to calculate the strength of the 68 FNAC reports given without using TBSRTC in predicting malignancy on histopathology. Sensitivity was 62.5%, specificity was 100%, positive predictive value (PPV) was 100%, negative predictive value (NPV) was 89.7%, and accuracy was 91.7%. Similarly, the strength of the FNAC reports given using TBSRTC category in predicting malignancy was also calculated. Sensitivity was 75%, specificity was 100%, PPV was 100%, NPV was 92%, and accuracy was 93.57%. There were a total of 109 FNAC reports which were reported implementing TBSRTC. This includes all the previous 68 cases reported in the pre-TBSRTC method, because all cases were screened and appropriately fitted into the TBSRTC. There was an improvement in the diagnostic accuracy and sensitivity where sensitivity increased from 62.5% to 75% and the diagnostic accuracy increased from 91.17% to 93.57%. We in our study have also tried to analyze the common cytologic features that hamper accurate diagnosis. Histopathology was considered as the gold standard for final diagnosis in all cases. Two common scenarios were identified: overdiagnosis of malignancy and underdiagnosis of follicular neoplasm or malignancy. In the first scenario, hyperplastic changes in nodular goiter and Hashimoto's thyroiditis were misdiagnosed as papillary thyroid carcinoma (PTC). In nodular goiter, increased cellularity, large sheets of follicular cells with round nucleus, pale chromatin, and occasional nuclear grooving were the cytological features misleading to diagnosis of PTC. The sheets of follicular cells entangled within the blood clots also gave impression of pale clear chromatin. The cases of Hashimoto's thyroiditis with focal pale powdery chromatin, occasional nuclear inclusion, and intranuclear grooving were the culprit for the diagnosis of PTC. Overdiagnosing PTC on the basis of few cytological features in the focal areas should be interpreted with caution. The following nuclear features should be carefully looked for: enlarged oval or irregularly shaped nuclei with longitudinal nuclear grooves and intranuclear cytoplasmic pseudo-inclusions, pale powdery chromatin, and solitary or multiple marginally placed nuclei. In the other scenario, cases with limited cellularity, presence of more number of large follicles over microfollicles, and failure to pick up these microfollicles lead to underdiagnosis of follicular neoplasm as benign nodules. Awareness about microfollicles thus becomes important. There was failure to pick up atypical histiocytoid cells on cytological slides. Scattered groups and sheets of follicular cells with pale nuclei with occasional nuclear grooving and absence of intranuclear inclusion were considered as a part of cystic degeneration in colloid goiter and not as PTC, thereby leading to an underdiagnosis. Comparison between the two eras revealed that there was a total absence of indeterminate cases (7.3% to 0%), an increase in ability to look out for follicular neoplasm (0% to 11.9%), improvement in making a definite diagnosis of malignancy (14% to 19%), and minimizing suspicious cases (13% to 4%). A thyroid FNA sample is considered adequate for evaluation if it contains a minimum of six groups of well-visualized follicular cells with at least 10 cells per group, preferably on the same slide. The use of these well-defined criteria for adequacy is helpful as they improve diagnostic efficiency of thyroid FNA. The most common pitfalls for false-negative diagnoses in thyroid FNA consisted of suboptimal materials and underdiagnoses of PTC due to cystic degeneration., Theoharis et al. found a significant decrease in the rate of nondiagnostic category after implementation from 10% to 30%. Brister et al. found that there was a significant decrease in usage of suboptimal benign including cyst category (21%–3.2%) in the second era, however, at the cost of significant increase in the rate of AUS (3.7%–12%). TBSRTC holds the advantage of having a standardized reporting format and uniformity of reports thereby being more informative to clinicians. The predictive value of thyroid fine needle aspirates has increased significantly with the use of thyroid FNA. The rate of malignancy in this study was comparable in most of the categories to that mentioned in TBSRTC, except the ND/UNS and AUS category [Table 3].,,, The ND/UNS category in our study yielded a malignancy rate of 33.3%, when compared with 1%–4% in TBSRTC. Of the three cases in the ND/UNS category, one turned out to be malignant. The high rate of false-negative diagnoses in ND/UNS category in our study probably could be due to less sample size. Srbova et al. also found a similar result. They state that it could be due to selection bias as patients with suspicious clinical and sonographic findings were selected for surgery. When patients with clinical follow-up were included, malignancy rate reduced from 5% to 2.5% in their study. Wong and Balochin their review have also analyzed that the implied cancer risk of the ND/UNS category has shown marked variability in literature, most of them moving beyond the 1%–4% as outlined by TBSRTC. Similarly, Jo et al. have also reported the implied cancer risk of ND/UNS category as 8.9% which definitely exceeds the upper limit of 4% of TBSRTC. 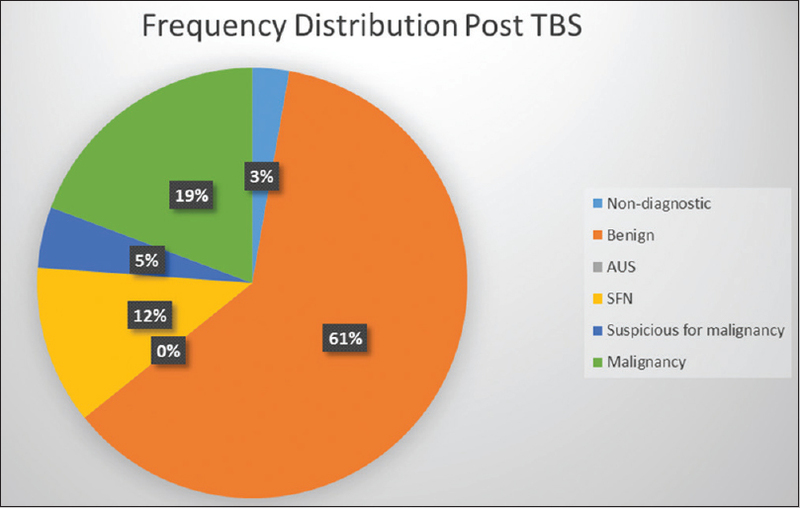 Similarly, category III (AUS/FLUS) lesions were also seen to have a much higher risk of malignancy (26.6%–37.8%) than that outlined by TBSRTC (5%–15%) in a study by Ho et al. and the authors concluded that TBSRTC may warrant reconsideration of current recommendation for AFLUS category. Tepeoğlu et al. also concluded that the classification and management recommendations of TBSRTC are applicable to practical setting, except the AFLUS category. In our study, after the application of TBSRTC, sensitivity increased from 62.5% to 75% and diagnostic accuracy from 91.17% to 93.57%. This finding is similar to that of other studies except for Srbova et al. who did not notice any improvement in the diagnostic category between the two eras. They recommend that when in uncertainty, both cytopathologist's recommendation and clinical decision including ultrasonograpy evaluation should be taken into consideration. Nevertheless, the authors accept that TBSRTC is useful for communication between centers. Bongiovanni et al. in their meta-analysis of TBSRTC also conclude that TBSRTC has proven to be an effective scheme to guide the clinical management of patients with thyroid nodules as evidenced by its high sensitivity and high NPV. They also stated that there was a growing trend across institutions to adopt TBSRTC because of its clear and comprehensible reports. We conclude that application of TBSRTC results in reduction in percentage of indeterminate (noncommittal descriptive reports) cases, uniformity in reporting among pathologists in categorization of thyroid lesion, improvement in our capability to diagnose follicular neoplasm, improvement in our capacity to diagnose thyroid carcinoma, end of descriptive reports, and an adoption of more consistent and uniform reporting with better interdisciplinary communication and patient management. Theoharis C, Adeniran AJ, Roman S, Ann Sosa J, Chhieng D. The impact of implementing the Bethesda system for reporting of thyroid FNA at an academic center. Diagn Cytopathol 2013;41:858-63. Cibas E, Ali S. The Bethesda system for reporting thyroid cytopathology. Am J Clin Pathol 2009;132:658-65. Gerhard R, Boerner S. Evaluation of indeterminate thyroid cytology by second-opinion diagnosis or repeat fine needle aspiration: Which is the best approach? Acta Cytol 2015;1-8. Guo A, Kaminoh Y, Forward T, Schwartz FL, Jenkinson S. Fine needle aspiration of thyroid nodules using the Bethesda system for reporting thyroid cytopathology: An institutional experience in a rural setting. Int J Endocrinol 2017;2017:9601735. Olson M, Boonyaarunnate T, Atlinboga A, Ali S. “Suspicious for papillary thyroid carcinoma” before and after the Bethesda system for reporting thyroid cytopathology: Impact of standardized terminology. Acta Cytol 2013;58:15-22. Wu H, Rose C, Elsheikh T. The Bethesda system for reporting thyroid cytopathology: An experience of 1382 cases in a community practice setting with the implication of risk of neoplasm and risk of malignancy. Diagn Cytopathol 2012;40:399-403. Sullivan P, Hirschowitz S, Fung P, Apple S. The impact of atypia/follicular lesion of undetermined significance and repeat fine-needle aspiration: 5 years before and after implementation of the Bethesda system. Cancer Cytopathol 2014;24:832-9. Crowe A, Linder A, Hameed O, Salih C, Roberstson J, Gidley J, et al. The impact of implementation of the Bethesda system for reporting thyroid cytopathology on the quality of reporting, “risk” of malignancy, surgical rate, and rate of frozen sections requested for thyroid lesions. Cancer Cytopathol 2011;119:315-21. Mahajan A, Lin X, Nayar R. Thyroid Bethesda reporting category, “suspicious for papillary thyroid carcinoma,” pitfalls and clues to optimize the use of this category. Cytopathology 2013;24:85-91. Dawish MA, Robert AA, Muna A, Eyad A, Ghamdi AA, Hajeri KA, et al. 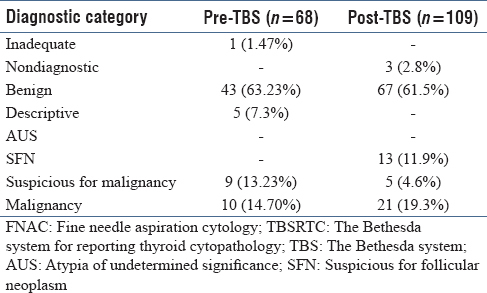 Bethesda system for reporting thyroid cytopathology: A three-year study at a tertiary care referral center in Saudi Arabia. World J Clin Oncol 2017;8:151-7. Brister KJ, Singh RS, Wang HH. Reporting thyroid FNA before and after implementation of the Bethesda system – One institution's experience. Diagn Cytopathol 2015;43:28-31. Srbova L, Gabalec F, Ryska A, Cap J. Results of retrospective classification of thyroid FNAs according to the Bethesda system: Would this have improved accuracy? Cytopathology 2014;1-7. Jo V, Stelow E, Dustin S, Hanley K. Malignancy risk for fine needle aspiration of thyroid lesions according to the Bethesda system for reporting thyroid cytopathology. Am J Clin Pathol 2010;134:450-6. Ho A, Sarti E, Jain K, Wang H, Nixon I, Shaha A, et al. 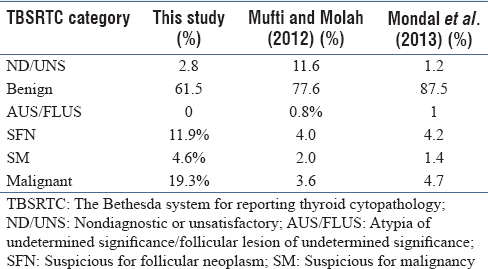 Malignancy rate in thyroid nodules classified as Bethesda category III (AUS/FLUS). Thyroid 2014;24:832-39. Tepeoğlu M, Bilezikçi B, Bayraktar SG. A histological assessment of the Bethesda system for reporting thyroid cytopathology (2010) abnormal categories: A series of 219 consecutive cases. Cytopathology 2014;25:39-44. Bongiovanni M, Spitale A, Faquin W, Mazzucchelli L, Baloch Z. The Bethesda system for reporting thyroid cytopathology: A meta analysis. Acta Cytol 2012;56:333-9.